Just off the southern tip of Florida in the Gulf of Mexico, sail or fly to the Dry Tortugas National Park and marvel at the wondrous unspoiled beauty that awaits. 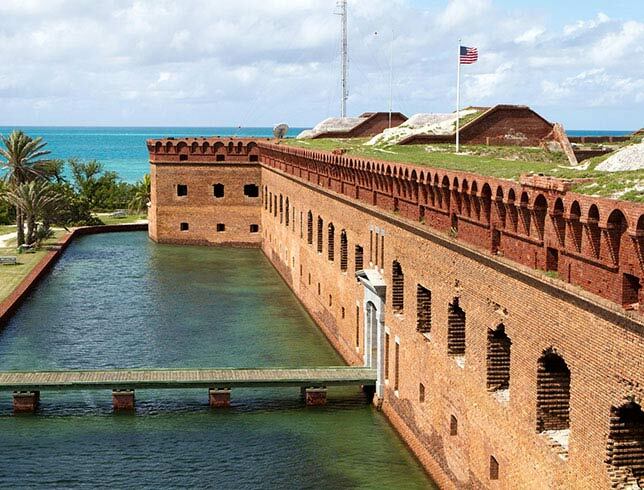 Located 70 miles off the shore of Key West, Dry Tortugas National Park is comprised of seven remote islands and home to the historic pre-Civil War era, Fort Jefferson. With pristine white-sand beaches, coral reefs, and ocean waters filled with shipwrecks and marine life, explore all the best Florida has to offer. A diver's dream destination, SCUBA, snorkel, and swim through over 67,000 acres of coral reef. Swim with nurse sharks, moray eels, and angelfish, and soak in the natural wonders of the Dry Tortugas. Embark on a ranger-led tour of the 19th century-built Fort Jefferson, or spend the day picnicking, bird watching, saltwater fishing, and kayaking in the crystal blue tropical Gulf waters. There is a $10 entrance fee. Open 24 hours, 7 days a week. Each remote island has different hours. How do you get to Dry Tortugas National Park? Due to the park's remote location, getting to Dry Tortugas National Park does require some planning. Unlike any other national park in Florida, you can only reach the Dry Tortugas by boat, ferry, or plane. You can sail over on your boat, charter one, hop on the ferry, or fly in via seaplane. It is 70 miles off the tip of Key West and takes about 2.5 hours by boat to get there. Is Dry Tortugas National Park open? Yes, the Dry Tortugas National Park is open 24 hours/day. However, each remote island has their hours. Garden Key is open 24 hours a day. Ft. Jefferson on Garden Key and Loggerhead Key is open from sunrise to sunset. Bush Key is seasonally closed during the sooty tern nesting season but back open from mid-October to mid-January. While East Key, Middle Key, Hospital Key, and Long Key are currently closed year-round for nesting wildlife. The Florida Keys Eco-Discovery Center is open Tuesday - Saturday from 9 am - 4 pm and the Garden Key Visitor Center is open every day from 8:30 am - 4:30 pm.